The Scottish Government (Rural and Environment Science and Analytical Services Division) Strategic Research Programme (SRP) has launched its latest Spotlight document featuring examples of outcomes and impacts from the 2013-2014 annual progress report. This document was showcased as part of the presentation at the Strategic Programme’s stand within the Scotland Food and Drink Pavilion at “Food Matters Live”, Excel Centre London 17-19th November, 2015 and “Scotland’s Science, Past Present and Future” at Our Dynamic Earth, Holyrood, Edinburgh, 8th December 2015. 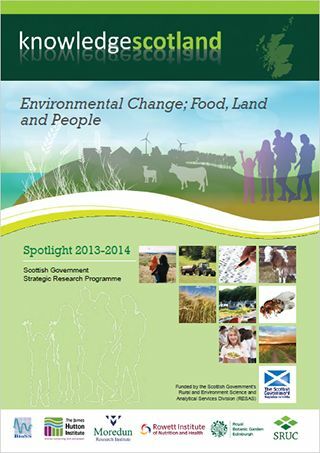 This latest edition of Spotlight, through the research of the two interlined programmes of: Environmental Change (local responses to global change) and Food, Land and People (optimising the potential of Scotland's natural assets), provides an extensive array of new examples from the SRP’s impact to policy and practice and its support for innovation and economic growth. Impacts to policy include: benefits gained from sustained, multi-expert contributions towards Scotland’s Biodiversity Strategy, Common Agriculture Policy reform and rural community economic resilience and development. Amongst the range of further impacts highlighted and that exemplify the SRP’s influence in spanning and integrating research on the natural environment, primary agri-production and through to human health and wellbeing, are: Integrated Pest Management approaches, including preparedness on the pest, Spotted Wing Drosophila; diagnostic and vaccination approaches for tackling livestock disease; collaborations to benefit livestock farming through innovative research to reduce greenhouse gas emissions; the forging of new partnerships benefitting forest management and resilience; new research evaluating High Nature Value farming; sustained international collaboration on potato cyst nematode genome sequencing and research targeting prevention and treatment of type II diabetes. The SRP research is delivered through trans-disciplinary collaboration, across the Main Research Providers (MRPs) (James Hutton Institute, Moredun Research Institute, Rowett Institute of Nutrition & Health, Scotland’s Rural College, Biomathematics & Statistics Scotland and Royal Botanic Garden Edinburgh). The Spotlight document highlights impacts from the current SRP and also from research that has benefitted from the long term sustained Scottish Government funding of scientific capability within the MRPs. The next Spotlight edition will follow in the New Year.